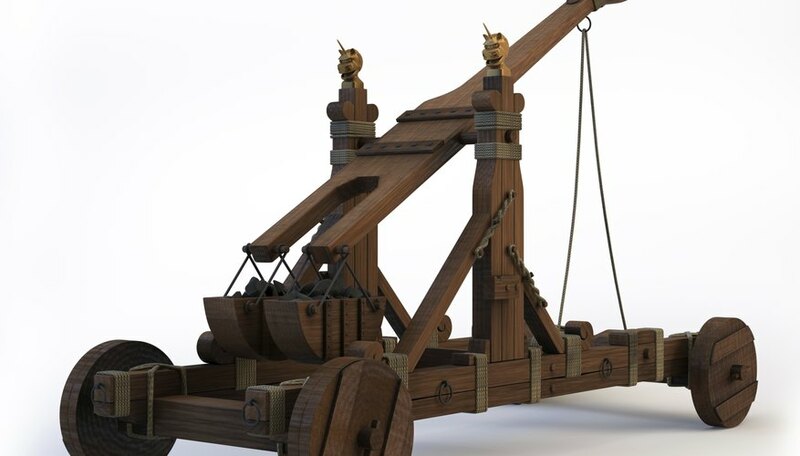 Catapults were large, prominent pieces of medieval weaponry that allowed soldiers to hurl rocks and flaming missiles over the high, barricaded walls of castles and cities. Catapults work by transferring stored energy into moving energy to project an object. The stored energy comes from tension in ropes or gears similar to a sling-shot, but on a much larger scale. Simple catapults resemble see-saws and use the force of a counterweight to project an object through the air. Science fair projects can explore the physics principles that let a catapult function and test varying catapults to demonstrate their differences. Catapults demonstrate stored energy in a stretched elastic band or tightly coiled metal spring. An unstretched elastic band or spring has no energy; stretching it creates tension energy that is stored until the band or spring is released and allowed to bounce back to its original form. This physics principle is referred to as elastic or spring potential energy. Another type of catapult uses gears or a pivot-point to create energy using torque force, which rotates or turns things. Torque is calculated by multiplying force by distance. It also gives energy to catapults that use the principle of a lever to project something, similar to how to a see-saw works. Stored potential energy and force is transferred to the catapult arm, which throws the projectile, giving it kinetic, or moving, energy. Use elastic tension to make a simple, desktop catapult to test the hypothesis that a shorter and thicker elastic band contains more stored energy than a longer, thinner one. Create a rectangular base for the catapult using wooden sticks, so that it resembles two open squares stacked beside each other. Use another stick to create the catapult arm. Fix the arm to the middle of the base on a hinge made of tape, so that it can be moved completely forwards and backwards. Tie a short rubber band on one end of the base and attach the other end close to the top of the arm. Use a small ball of clay as your projectile and place it on the top of the catapult arm. Next, pull the arm back so that it lays in its cradle and stretches the elastic band. Hold the catapult arm down with your finger, aim and release. The elastic band springs back to its original shape, giving the catapult kinetic energy that projects the clay ball. Repeat the test with a longer rubber band and record the differences in projectile distance to form a conclusion about your hypothesis. A lever uses the same physics principles to lift or project things as bottle openers, cranes, doors and catapults. A simple catapult can be made from a long, rigid piece of wood that rests on a raised pivot point or fulcrum near its center, like a see-saw for children. This forms a simple machine that can do work for you by lifting or pushing heavy loads using torque, or the force of rotation. Test the hypothesis that a taller fulcrum or a longer lever board will shoot the projectile further. Make several lever catapults using various lengths for the boards and different heights for the fulcrums. Use identical small soft toys as projectiles and have someone stomp on one end of the lever. Repeat the experiment on each lever at least three times. Measure and record how far each catapult is able to project. Analyze your results to determine if the hypothesis is correct. The trajectory of a catapult is the path and distance a projectile or object follows. This depends on two forces: the amount of energy transferred to it by the catapult and the downward force of gravity. While gravity stays the same, catapults can range in energy output depending on the speed, force and angle of the launch. Test the hypothesis that lighter projectiles have greater trajectories than heavier projectiles. Make various catapults using the lever and elastic method, with varying catapult arm and lever lengths. Project marshmallows or soft toys. Use a measuring tape to measure the trajectory distance of each catapult. Change factors such as the elastic band's length for greater stored energy, or raise the speed by stomping on the lever harder for both lighter and heavier projectiles. Chart the differences in the catapults and weights of the projectiles to compare the effects on the trajectories and find a conclusion.